23 MAY 2018 | Geneva, Switzerland—For the fourth year, the Every Woman Every Child (EWEC) Innovation Marketplace, in collaboration with the UN Foundation, and other partners hosted an interactive and exciting private event alongside the World Health Assembly. The breakfast event, held on May 23rd at the Intercontinental Hotel, brought together approximately seventy guests from across government, business, the UN and other multilateral organisations, as well as from civil society and the academic community. The event was opened by Dr. Teesta Soman, Director of the EWEC Innovation Marketplace. She recognized the co-hosts of the event, namely the Governments of Canada, Norway and Uganda, together with the Partnership for Maternal, Child and Adolescent Health (PMNCH) and the World Health Organisation for their support in convening the breakfast discussion. She noted that the five exciting innovations featured on the program all promote women’s, children’s and adolescents’ health through either service delivery or technological innovations, and have successfully received transition-to scale funding brokered by the EWEC Innovation Marketplace and its partners. The event and associated meetings in Geneva were aimed at enabling the innovators meet business, government and development contacts that could help them scale their impact. 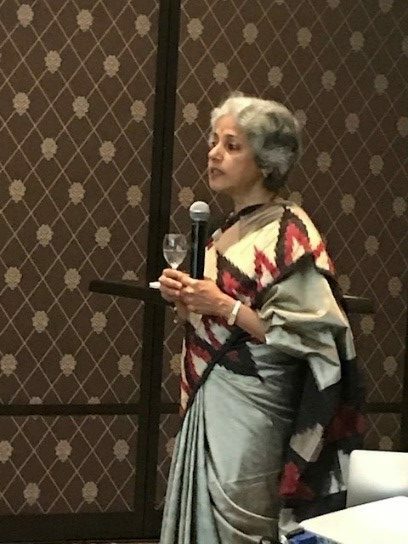 Dr. Soumya Swaminathan, Deputy-Director General for Programmes at the WHO then provided key-note remarks, during which she noted that innovators are often not linked to policy makers, research funders or end users. It is important for them to build bridges from the beginning, which will increase the likelihood that their innovations will subsequently be adopted. Dr. Swaminathan stated that WHO is embracing innovation, and is ready to work with the EWEC Innovation Marketplace to help open doors for innovators and connect them with Ministries of Health, and ensure that their innovations are linked to national priorities. Dr. Swaminathan was followed by Co-Chair of the High-Level Steering Group for EWEC and new Board Chair of PMNCH, Dr. Michelle Bachelet, who is the former President of Chile and former Executive Director of UN Women. 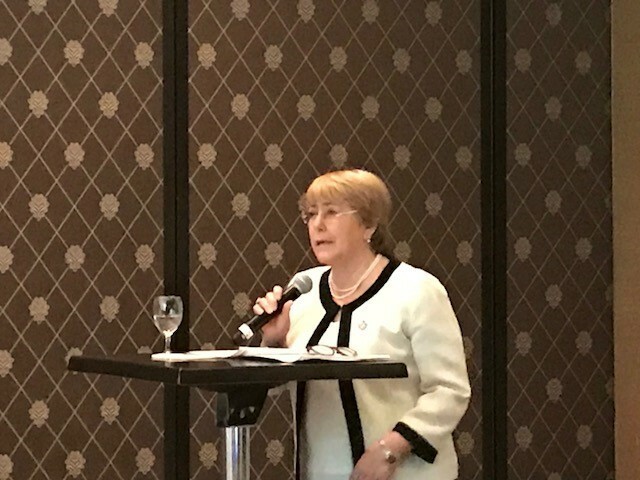 Dr. Bachelet emphasized the importance of innovation and of partnerships in achieving the EWEC Global Strategy for Women’s, Children’s and Adolescents’ Health and the SDGs. Dr. Bachelet pledged the support of PMNCH in catalyzing partnerships between public and private sectors to help stimulate results. Dr. Amy Baker, Director-General of Health and Nutrition in the Global Issues and Development Branch of Global Affairs Canada, highlighted Canada’s feminist foreign policy, in which innovation is regarded as an opportunity to empower women and girls and reduce poverty. She encouraged the Innovation Marketplace to not only see women and girls as beneficiaries of innovation, but also as catalysts of innovative solutions. The five innovators then presented their innovations via brief power point presentations and held a brief dialogue with Dr. Stefan Peterson, Associate Director and Chief of the Health Section at UNICEF. Ratul Narain presented the BEMPU Hypothermia Bracelet, a novel, continuous temperature-monitoring bracelet worn by an infant, which alerts parents or caregivers via a flashing light if the newborn is hypothermic. The bracelet aims to tackle neonatal hypothermia, one of the leading contributors to newborn morbidity and mortality, especially in low-resource settings, and empowers the caregiver to warm the baby with Kangaroo Mother Care (KMC) well before oxygen deficiency, glucose deficiency, poor growth or death can occur. Next, Dr. Saima Malik presented Save the Children’s First Steps program in Rwanda, which promotes healthy early childhood development by providing holistic parenting education to parents of 0-3-year olds through radio programming and structured community-based peer learning groups. Parents are provided guidance on topics that increase the chances of children meeting developmental milestones and that increase positive health practices among parents. Open-defecation is a major cause of child-diarrhea in India, with the state of Bihar being home to some 80 million people or 12%) of the country’s population who do not use safe, affordable toilets. Ms. Aprajita Singh of the Population Services International (PSI) team in India presented a market development approach that has successfully created a sustainable sanitation market by joining up manufacturers, entrepreneurs and consumers thus ensuring adequate, affordable supply to meet demand. Finally, participants heard from Dr. Venkatesh Manar about the Iron-Fortified Tea innovation, which was presented via a video link. Dr. Manar and Dr. Diosay of the University of Toronto have a proven technology that allows iron to be integrated in a loose leaf tea. The iron can be absorbed by the body and combining it into tea enables populations with large tea drinkers, such as in Asia and many parts of Africa, to intake iron as part of their routine activities. Iron deficiency is the most extensive nutritional disorder in the world and this unique technology provides a third of an adult’s daily requirements of iron via two cups of tea. The innovations were all extremely well received by participants and Dr. Peterson led a lively discussion during which further questions were posed to the innovators. Dr. Henry Mwebesa, Director-General of the Ministry of Health of Uganda noted that all the innovations were well adapted to developing countries, and that Uganda would be keen to find out how to collaborate with the innovators and take up some of them in Uganda. He also noted the importance of using relevant platforms to make such solutions visible, since he would not have known about the innovations had he not attended the breakfast event. Mr. Haitham El-Noush, Senior Advisor at Norad, similarly lauded the diversity of the innovations, and the importance of the EWEC Innovation Marketplace platform in sourcing a wide range of innovations and carefully identifying those that are most likely to scale given the additional investment and partner network. In closing the event, Natalie Africa, Senior Director for Global Health & Private Sector Engagement at the United Nations Foundation, emphasized the need for partnerships with organisations such as WHO and PMNCH to scale innovations and ensure sustainability and uptake of solutions at country level. She also recognized the role of business partners in working alongside the Innovation Marketplace to support innovators in perfecting their innovations through financial as well as in-kind assistance and expertise. Check out these one-on-one interviews with a few of the EWEC innovators below!